Heading north to check out the Kingdom Trails. Ride reports and photos when I return. 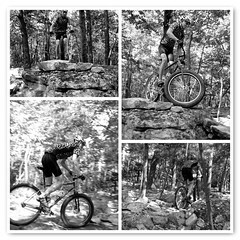 Here's a quick sequence from Wednesday's ride, Chris taking on some Watershed rocks on his fixed gear. If you want to stay busy while I'm gone, check out my teammate Donna's extensive set of photos from the 24 Hours of Big Bear (2 sets actually). She even took the time to ID team numbers for easy searching. So if you were racing, you might be in there. My old Kelly Ro Sham Bo has been sitting unused for a bit lately. It was my first 29er and has seen many miles but I have not treated her kindly. Dented and chipped, the frame looks like it has survived a small war and perhaps it has considering how I tend to ride my bikes. 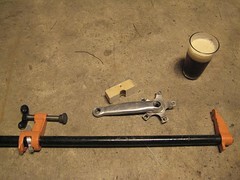 The frame had been disassembled when I was testing the Jabberwocky. Prior to that a broken and siezed seatpost prompted me to acquire a Qball, as I thought I was going to bury the Kelly and I needed another frame. The frame survived thanks to my friends at The Bicycle Escape but I was left with one too many bicycle frames. A problem most would like to have, but a problem none the less. An inventory of the various take-offs, spare parts and worn bits in my garage yielded the fact that I had the goods to assemble the Kelly into a rideable machine. Occasionally on the looooong downhills I hit on some of my mixed surface rides I'll dream of freewheeling and maxing out my speed instead of flailing the legs on the fixed gear. Missing in the quiver was some type of freewheeling machine capable of dirt roads, pavement and singletrack so this seemed to be the answer. Drop bars recently removed from the wife's cross check were grabbed, cross tires hanging from the rafters were pulled down, a beat up Sugino XD crank was dusted off. 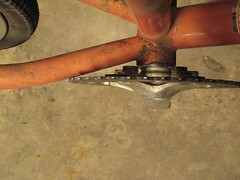 A 42 tooth chainring, worn but still usable, was removed from the peg board. And this is where trouble began. Seems the fat chain stays of this MTB did not like the large ring when the single speed chainline was in it's ideal position. What to do? So, the good thing about steel bike frames is, you can make little mods like and not kill the frame (at least that's my hope). In the end the clamp I used didn't work so well as I really needed 4 hands and I only had 2. 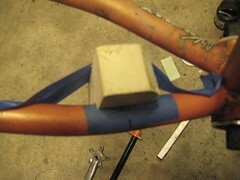 I mounted the frame in the work stand, then positioned it in the bench vise. Not easy either, given where the vise was mounted on my work bench, but it didn't take long to get set up. 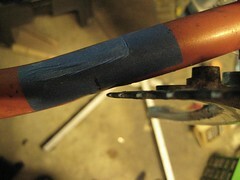 The crank arm pictured was used to press into the chainstay to gently massage the steel into place as I needed a chunk of metal and this was around and had a profile that seemed suitable. I figured I knew how to go about this, but consulted with some fine folks at Velocipede Salon before diving in. I still need to do a rim swap on the rear wheel as the frame is set up with canti-posts and the wheel is disc only. Luckily I have a spare rime with the appropriate ERD already in the garage. Build pix when I get around to completing the project.